If you were one of the 2 million people who call Gambia home, it's more than likely that you would feel migrating was the only way to make a living. After his father was killed in a thunderstorm on their farm, Filly felt he had no choice but to leave. But unlike some migrant teens swayed by glowing social media posts of migrants who'd made it big in Europe, Filly, who was just 15 when he set off on his own, felt deep regret leaving his mother. "Every time I think of my mother down there, I feel lonely and cry a lot. And I know exactly [what] […] she would be feeling: 'where is my son? Where is he now?' So it was very hard." Leaving home is only one wrenching facet of the migrant refugee experience. For Filly, the route across the Mediterranean was harrowing, and the adjustment to his new life in Palermo, Italy, has also been a trial. Sadly, he is not alone. According to Beyond Borders: How to Make the Global Compacts on Migration and Refugees Work for Uprooted Children, too many children confront xenophobia and discrimination, making integration into their new lives a painful process. Some migrants are subjected to physical harm. In Germany, for example, there were 3,767 attacks on refugees in 2016. While physical abuse isn't part of Filly's story, feeling distinctly unwelcome and dehumanized was. "Some people will run away from you like they are seeing an animal," he recounts in this video about the difficulty of adapting to his new home in Palermo, Italy. "I say to myself – why is this happening to me? Why is this happening to us blacks? We are equal." To ease an unaccompanied child's transition, UNICEF supports such efforts as the AccoglieRete volunteer guardian initiative, which was established in Italy to help protect the thousands of unaccompanied children who'd arrived since 2013. 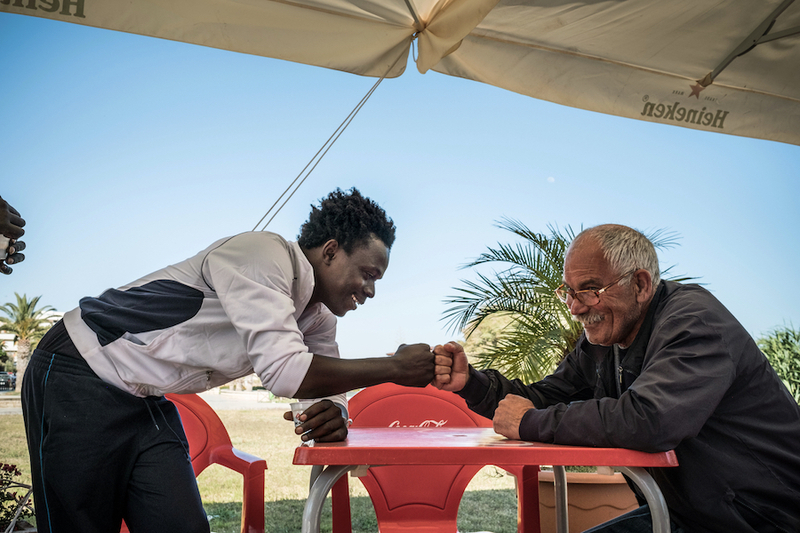 The program pairs Italian private citizens with vulnerable migrant children to help them meet all the challenges they face applying for asylum and getting access to health care, education and employment. Guardians are screened, trained and supported by the government every step of the way. Community response to the program is an encouraging antidote to stories like Filly's. Over 2000 private citizens have expressed interest in becoming guardians to help young people like Filly and Mohammad (below) navigate the complicated task of adapting to a new country. Although migrants like Mohammad and Filly have clearly proven they are survivors, they desperately need help to overcome all the obstacles to securing legal residence and rebuilding their lives from scratch. Thanks to UNICEF and guardians and foster families in Italy, they and thousands like them are getting that help — and forming the connections everyone needs to lead healthy, happy and productive lives.